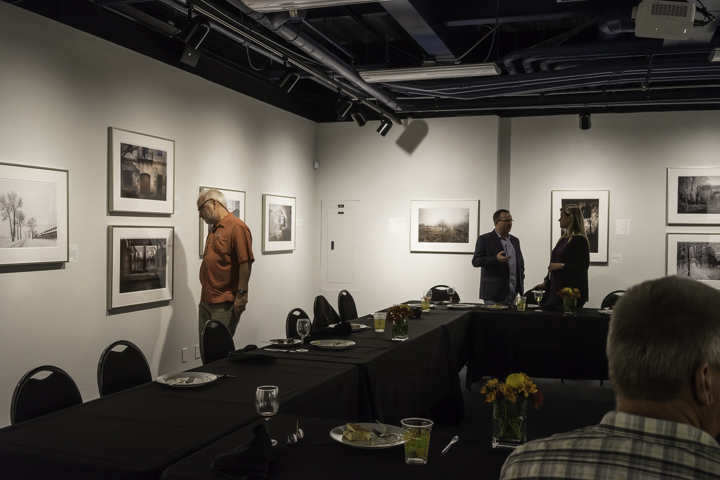 It was a privilege to have photographer Keron Psillas as our guest for the Loss and Beauty artist dinner on Sunday evening. Throughout the dinner we learned more about Keron, her vision for Loss and Beauty, and the journey she undertook to envision, create, and build the exhibition. From her book Loss and Beauty, she read one of her poems, “At Six Years Old,” which carried us into the lives of a group of young boys playing together in 1933 unaware they had “ten more summers of laughter and singing” before they were each murdered during the Nazi holocaust. Keron standing with a close friend, Peggy. The evening offered a unique opportunity to see the work and explore the questions about why. Valerie Foster and her husband Tom with Linda Abbott. Valerie the author of Risk of Sorrow, a biography of Phoenix resident Helen Handler as a young girl growing up in Poland, surviving Auschwitz, and living in the USA. Event images by Keron Psillas.